Have you or someone that you love been injured in a construction site accident in Peoria? For decades the experienced trial lawyers at Goldberg Weisman & Cairo have successfully challenged employers who refuse to provide the benefits our clients deserve while helping to recover more than $2 BILLION in compensation. 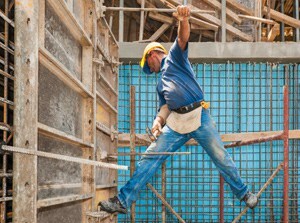 A construction accident lawyer who understands Illinois construction site accident laws is first and foremost an advocate for injured clients in multiple areas. Whether it is ensuring that the medical establishment files medical paperwork on time, or representing your interests in front of the Illinois Workers Compensation Commission, an attorney can help you get the full range of benefits. Our Peoria construction site accident attorneys have handled cases that have created new state laws that help construction site injury victims get the financial compensation that they deserve. Our record demonstrates our commitment to injured employees. Our firm excels at representing the interests of individuals who have legal problems. If you find yourself up against insurance companies, employers and insurance adjusters, do not act alone. Our founding partner Mr. Michael Goldberg has decades of experience ensuring that everyday working class Americans are not taken advantage of by large companies and insurance companies. For questions about how our firm can help you in the aftermath of a construction site accident, call us today 1-312-464-1234 or reach us online via our “Free Case Evaluation” form. …. and all of the towns and suburbs that surround these areas. We are the largest personal injury law firm in Illinois and have recovered more than $2 BILLION in compensation for our clients. Contact us today and lets discuss the merits of your potential personal injury lawsuit.